To see a detailed, short tutorial on my embossed DIY pendants with no embossing machine used go to my YouTube channel by clicking here. If you want to see the previous video on making embossed DIY pendants with an embossing machine, click here. 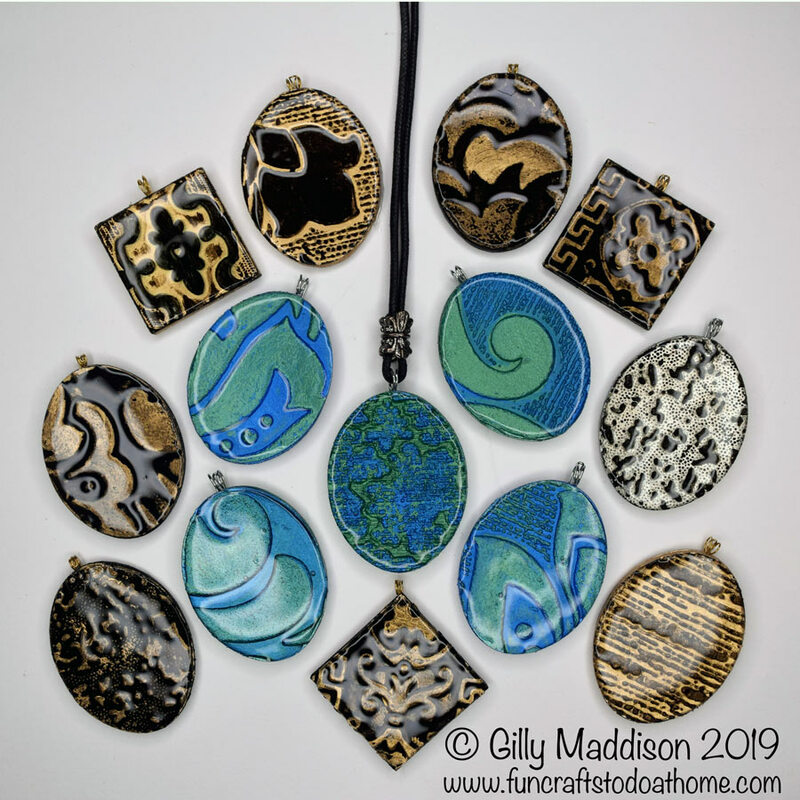 Your design choices will be limited when using the method outlined in my latest video but, the embossed DIY pendants you can make are very pretty and effective. This post is just a very quick follow up to my last YouTube tutorial in which I promised crafters who do not own an embossing machine, that I would tell you my secret for making them without one! Where to buy craft supplies like the ones used in my videos. For my Amazon.com store click here. For my Amazon.co.uk store click here. If you have watched my YouTube video about making DIY embossed pendants without an embossing machine, then hopefully you are full of ideas about making some of your own! If you have any questions, you can go over to my YouTube channel and ask in a comment underneath the video. I have loads more creative stuff for you in the pipeline - I wish there were more days in the week to get my video tutorials made! All these embossed DIY pendants were made without an embossing machine - REALLY easily - it's simple when you know how! If you enjoyed the video about embossed DIY pendants, please don't forget to subscribe to my blog and my YouTube channel - see you in the next project! Previous Previous post: Junk Jewelry – Cool Jewels – 80% Junk! Next Next post: Easy To Make Pendants – Great For Older Children To Make – With Help!